Help Mark celebrate his 70th birthday by riding his exceptionally beautiful Bicycle Icycle route in summer conditions, followed by a BBQ. No entry fee or tedious entry form. Ride as a group (or not if you prefer). Take a shortcut if necessary. Or just ride to Quarry Manor from your preferred starting point. 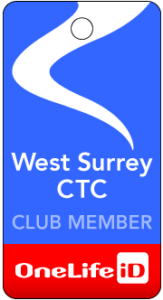 All West Surrey CTC members welcome! If you’ve never ridden the Bicycle Icycle, there are some hills but the final little brutes can be easily avoided. (Peel off right, once you’ve crossed the A281 at Bramley, up Iron Lane. Then head for Godalming.) There are several refreshment options on the route at Peaslake, Shere and Shamley Green. – Ride starts at 9.30am from 4 Quarry Hill, Godalming GU7 2NW and finishes there. – If driving to start, please park somewhere at the top of the hill. – Both the route sheet and GPX track are on the Events page of our website – see 18 March event. Route sheet also available at start. – Refreshments at the finish will commence at around 2pm. – Please bring something along to eat, be it cake or sausages or whatever. Leave it in my fridge while you ride. Basic snacks / nibbles / biscuits and salads provided. – Tea / coffee / beer / wine / juice provided. Please contact Mark with any queries.